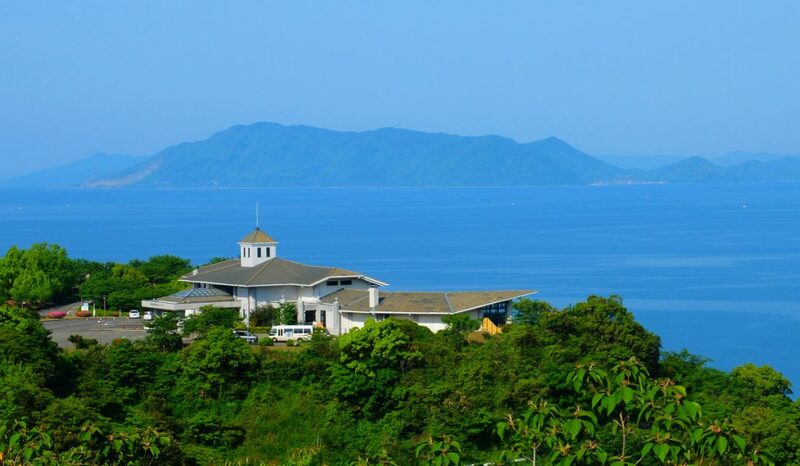 Located on the southern island of Kyushu along the west coast lies Kumamoto prefecture and its capital Kumamoto City. 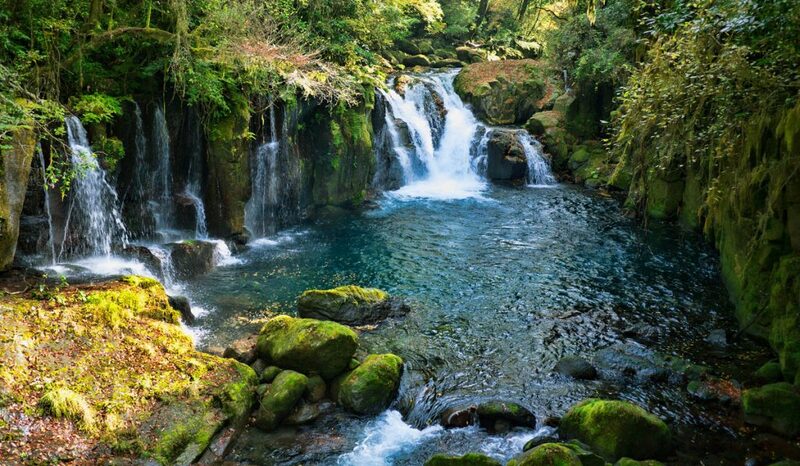 Much of the land is shaped by volcanic activity giving Kumamoto its distinct character unlike any other part of Japan. 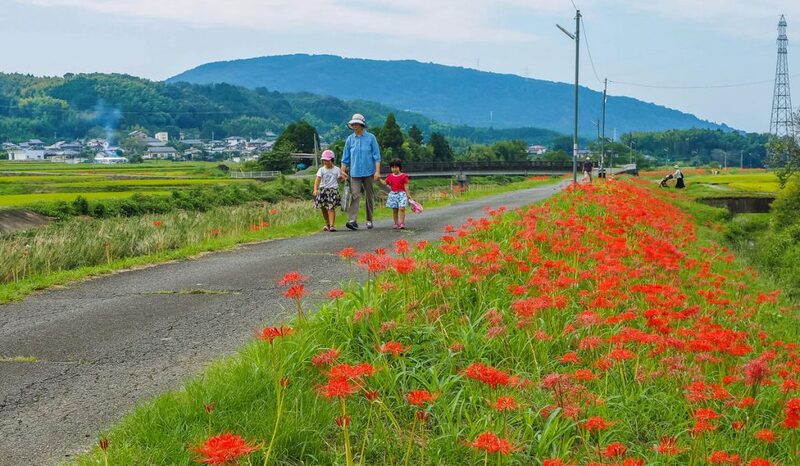 As much as 21% of the land is designated as natural parks, making Kumamoto one of the top destinations for nature enthusiast. 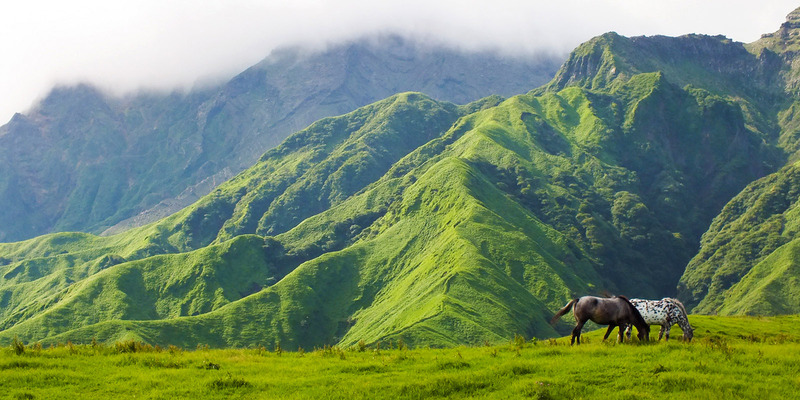 It’s also home to the largest active volcano in Japan, Mount Aso, standing at 1592 meters tall. A picture says a thousand words, lets travel through Kumamoto in 30 pictures that will make you want to go there. 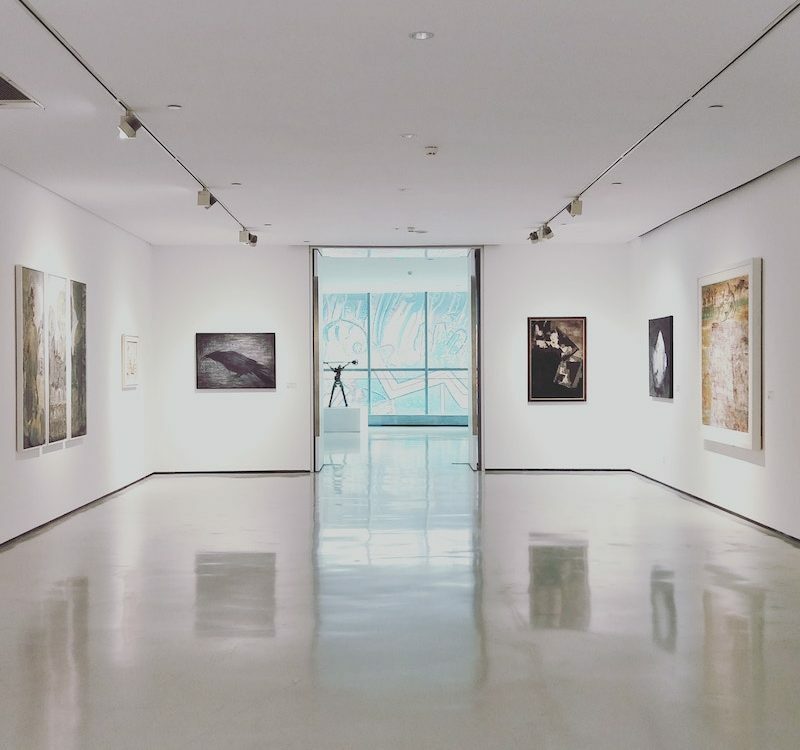 If you’re planning a trip to Kumamoto prefecture read our article: Kumamoto Japan – All You Need To Know To Enjoy Your Trip. 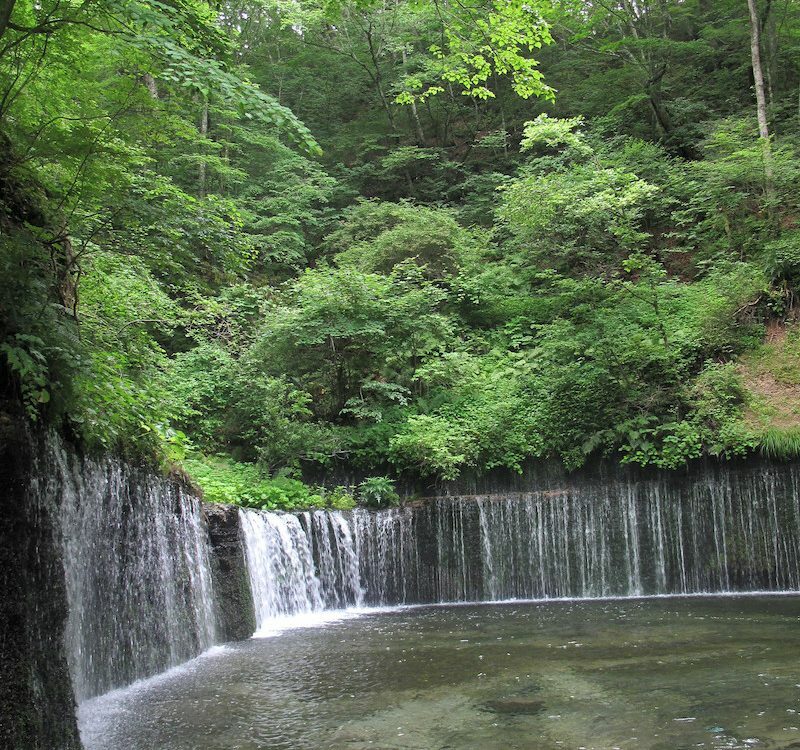 To the north of Kumamoto prefecture you’ll find Kikuchi Valley, famous for its natural beauty, autumn leaves and fresh mineral water flowing from the many waterfalls and rapids. 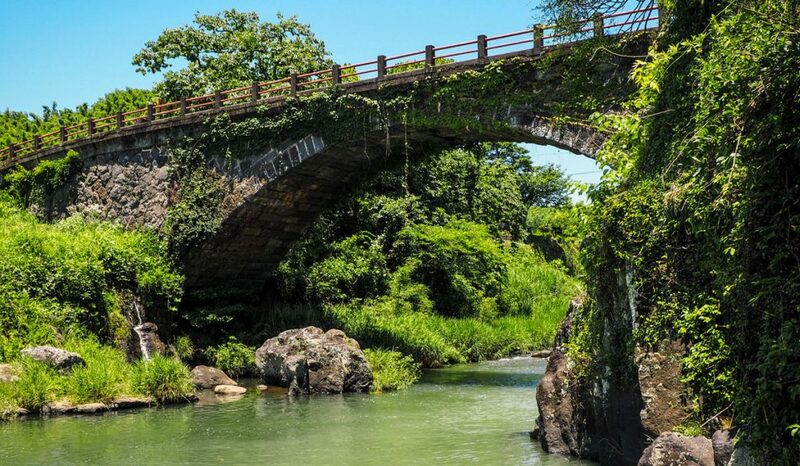 Ancient arch bridges like the Hazamabashi bridge found near the countryside are almost completely taken over by shrubs and vines adding to the rustic charm while a gentle stream flows underneath it. 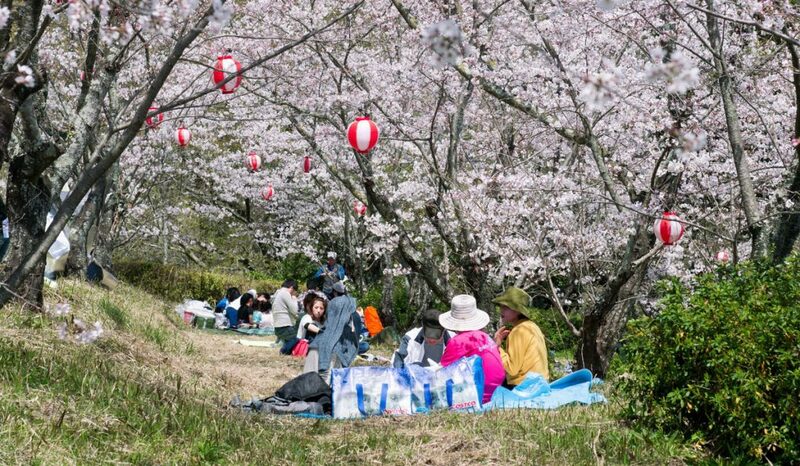 Blessed with nature and many sakura trees, many area’s in Kumamoto make a picture perfect setting for a cozy hanami picnic as you admire the flowers in bloom. Want to know where to view the best cherry blossoms? Read our article: Cherry Blossom Festival Japan – The Ultimate Guide. 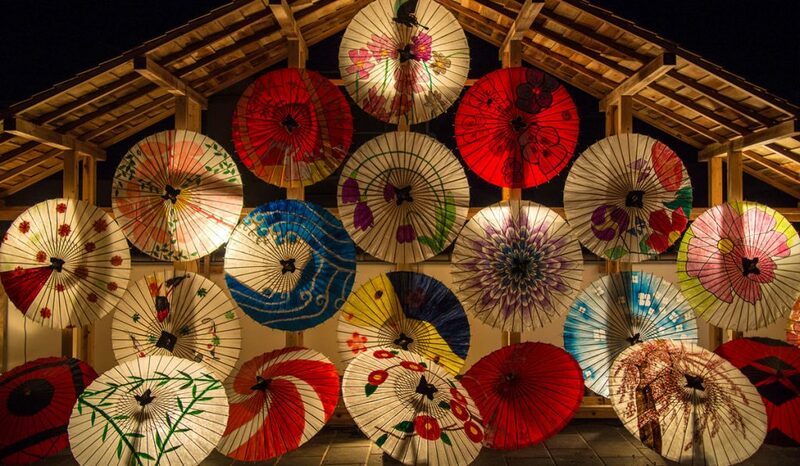 During the mystical lantern festival in Yamaga, visitors can enjoy beautiful bamboo lanterns and decorative Japanese umbrella light installations. A new day dawns on the village of Minamiaso as the morning mist clears away and young rice plants catch the warmth of the morning sun. 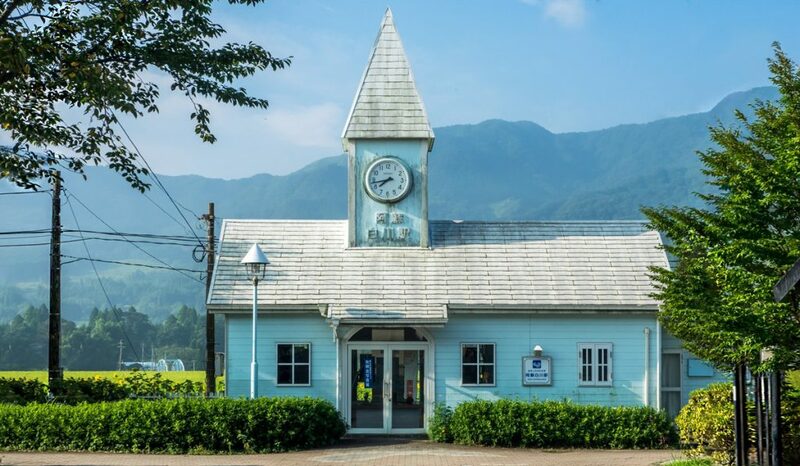 As if Hayao Miyazaki painted a life-like still for his next animation movie, this tiny blue and white wood constructed station has one platform and serves one train line. You’ll also find a small cafe within the station. 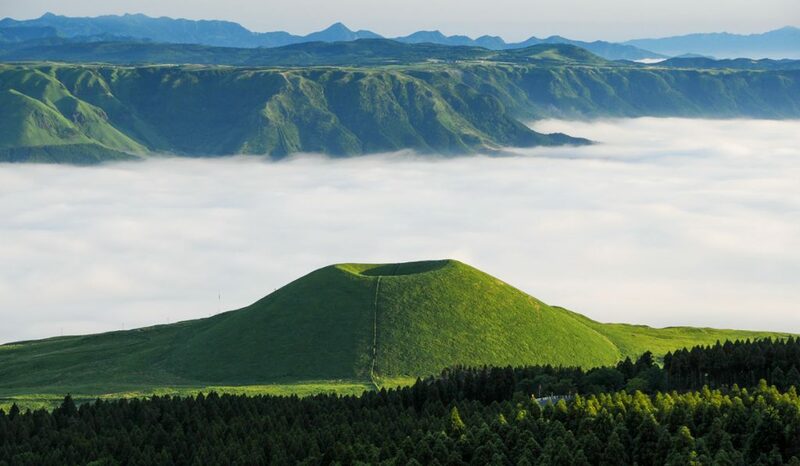 When traveling through Aso during the summer to autumn, you’ll can find Komezuka on the slopes of Nakadake. And if you’re lucky, you can even witness a sea of clouds creating a dramatic backdrop against the perfectly shaped volcanic crater. 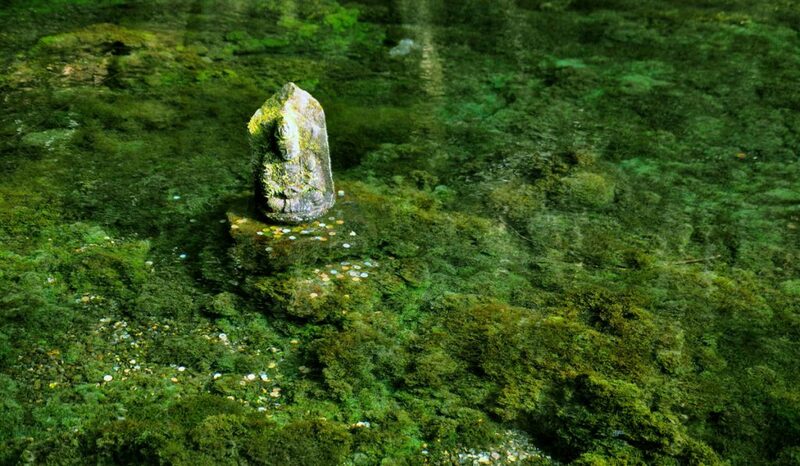 Surrounding the pond are 200-year-old cedar trees and at its center in the water stands the Water God blessing the pond with pure drinking water that has been a fresh water source for centuries. Nicknamed the “Milk Road” due to the many grazing cows on the grasslands, the Milk Road is a road on the rim of Mount Aso. Driving through the Milk Road (beware of falling rocks and other hazards though) will reward you with stunning vista’s not unlike the ones you might have seen in the Studio Ghibli animated film, Castle in the Sky. 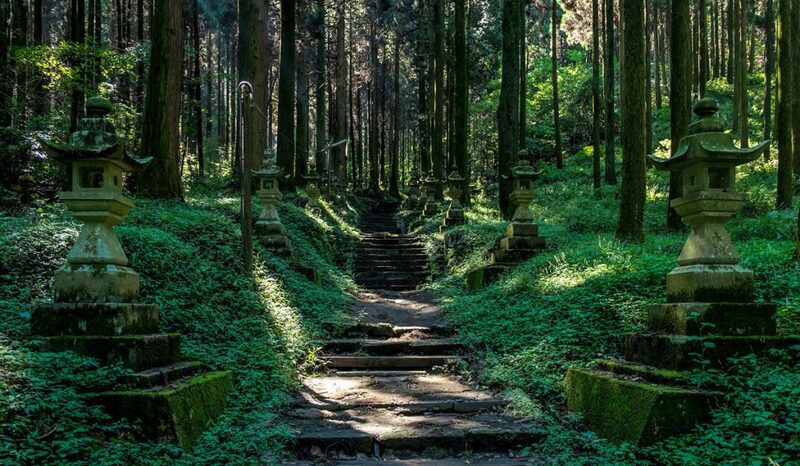 To reach the Kamishikimi Kumanoimasu Shrine, travel back in time and ascend the stone steps through the ancient forest as you pass stone lanterns on either side to find this hidden mysterious place. 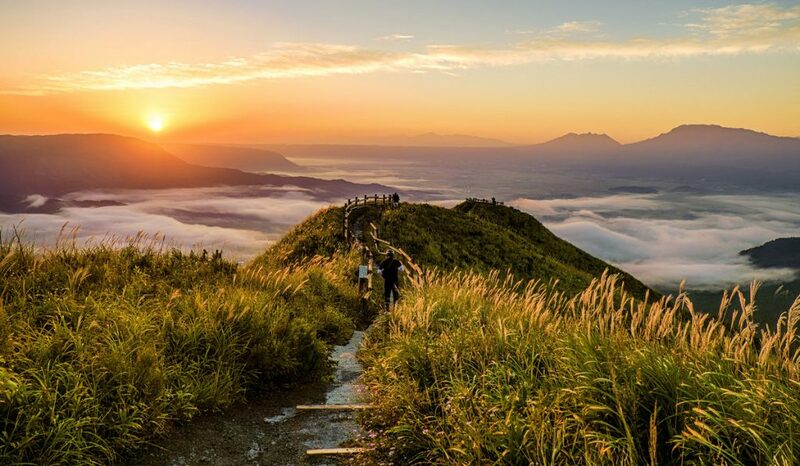 Hike up Mount Tawarayama (1095 meters) and enjoy a beautiful view over the village of Minamiaso. During the morning when the sun rises, a blanket of mist covers the valley adding a mystical atmosphere to the experience. You can find the Kabutoiwa Lookout while driving along the Milk Road. 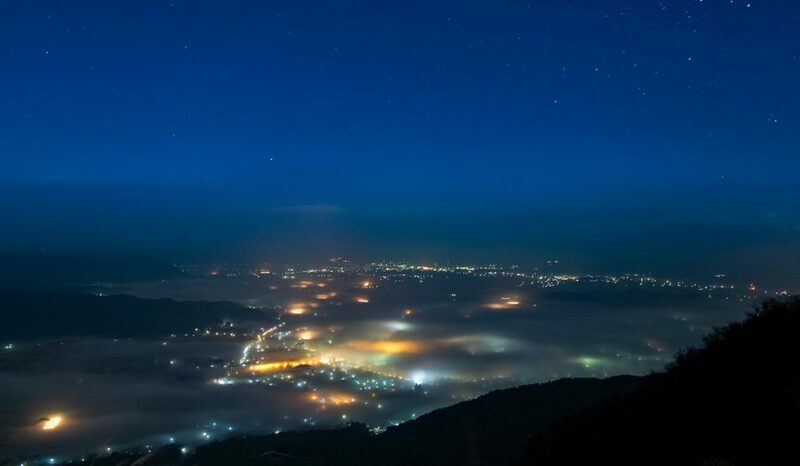 Driving when the sun goes down can reward you with a stunning view of the villages below as the stars above come out and reveal themselves. 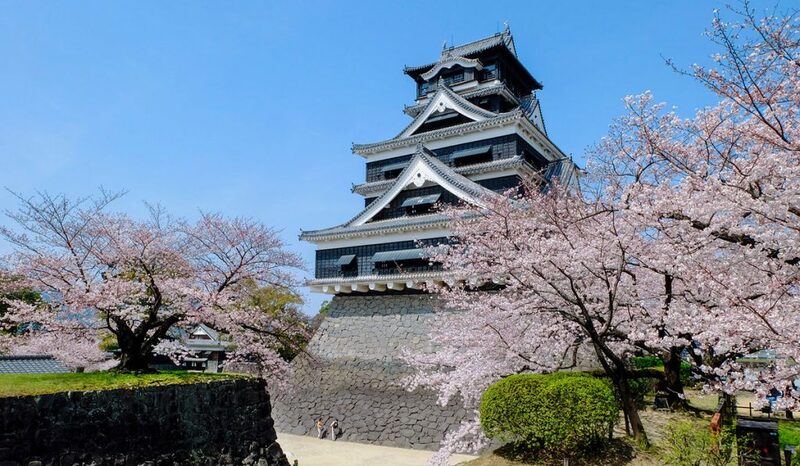 As one of the three premier castle in Japan, Kumamoto Castle sit majestically on top of a hilltop. With a long history dating back to 1467, Kumamoto Castle is just one of many buildings within the large castle grounds. 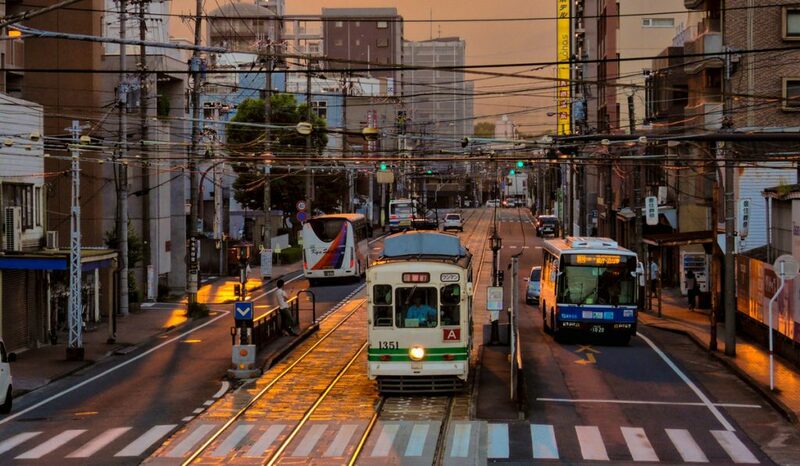 As the sun goes down, the central area of Kawaramachi colors golden, evoking the charm of a bygone era. 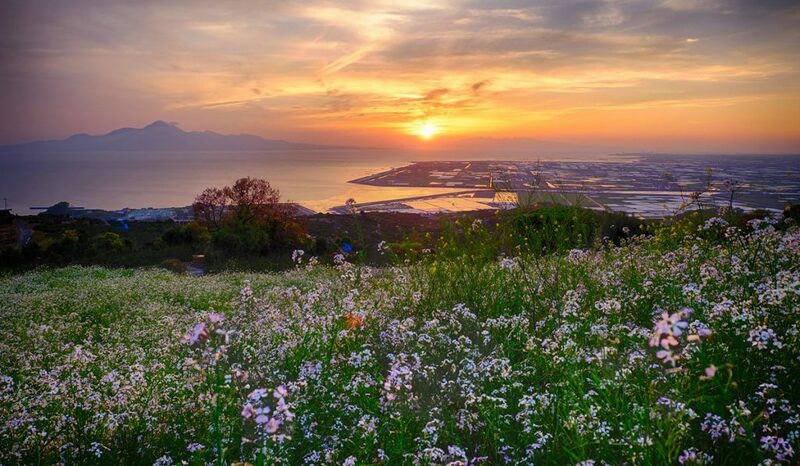 At dusk, the view from the hilltop over Kawachimachi is spectacular as the mountain range looms in the distance. 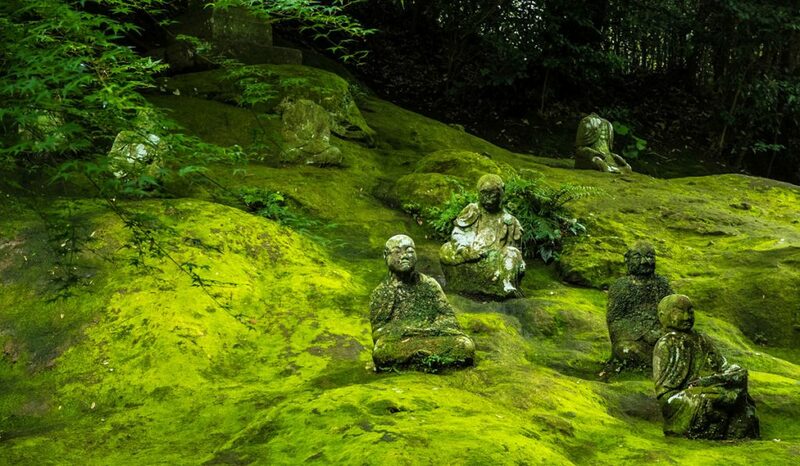 The stone Gohyakurakan statues depict the disciples of Buddha and have been completely overtaken by moss over time adding an almost eerie atmosphere to it. 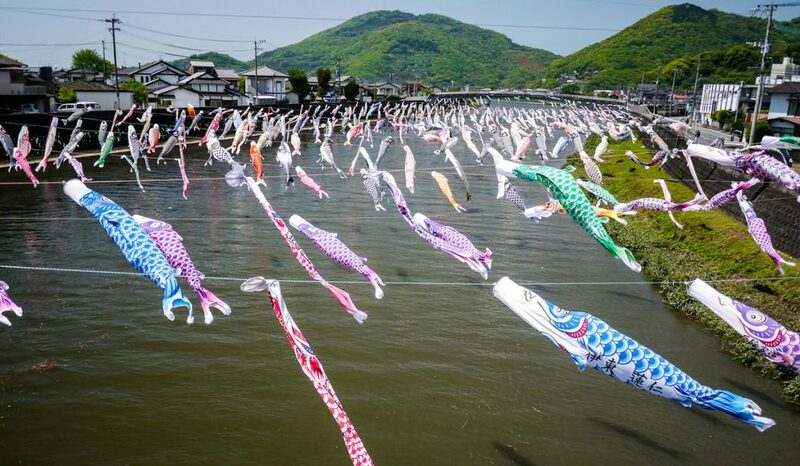 Colorful koinobori, carp-shaped windsocks, hang over the Tsuboi River fluttering in the wind, celebrating the last day of Golden Week, Children’s Day. 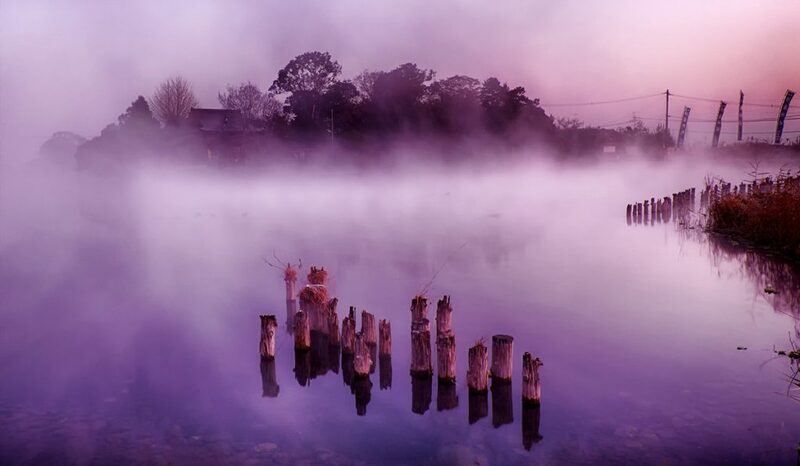 As if rising from the smoke, the morning glow and mist shroud the Ukishimakumanomasu Shrine in mystery. Watch the shrine appear in the morning as the sun rises. 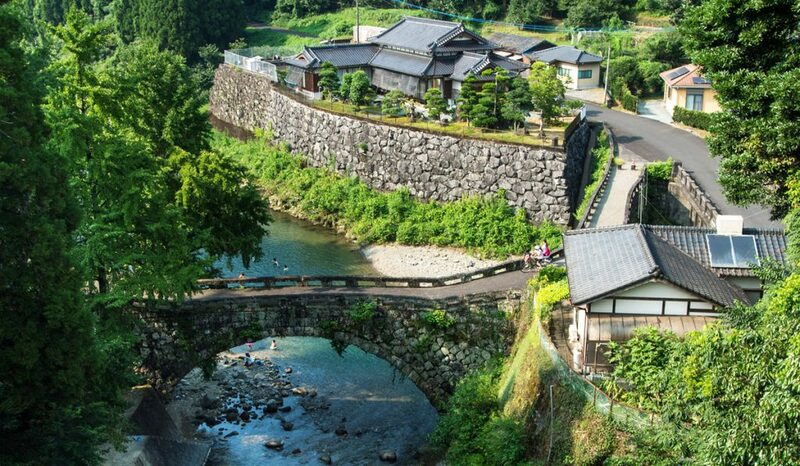 In the peaceful village of Misato you can find the arched Futamata Bridge. From the right angle the sunlight forms a shape of a heart under the bridge, earning it the nickname “Lovers Paradise”. 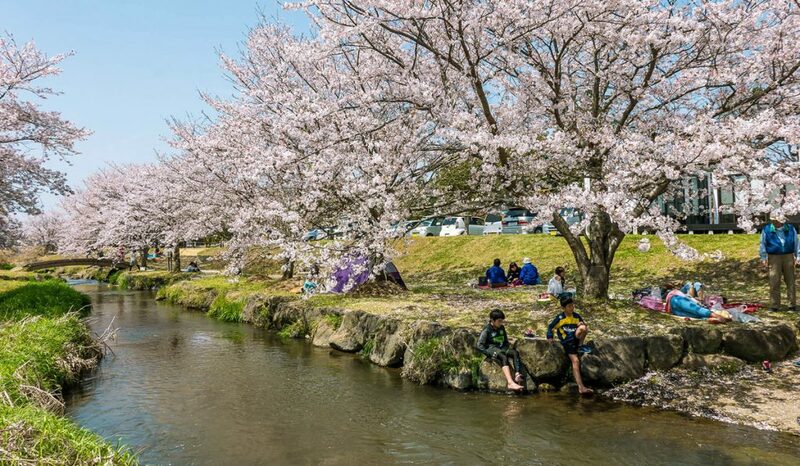 Blooming pink sakura trees line the riverbank of the Akizugawa River as children play near the cool water and parents enjoy a picnic in the sun under the beautiful cherry blossoms. Dotted along the countryside are many farm villages. Life goes at a much slower pace and the air is fresh. 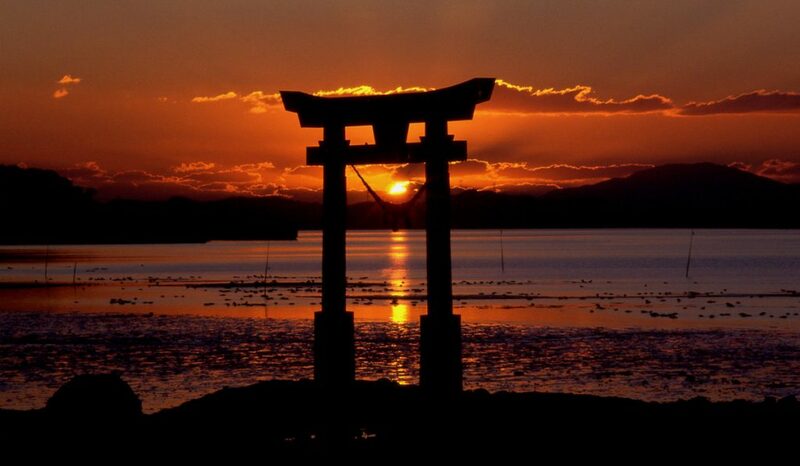 The sun sets on the Yatsushiro Sea, casting a fiery red glow on the torii gate of the Shiranuhi Einoo Shrine during low tide. 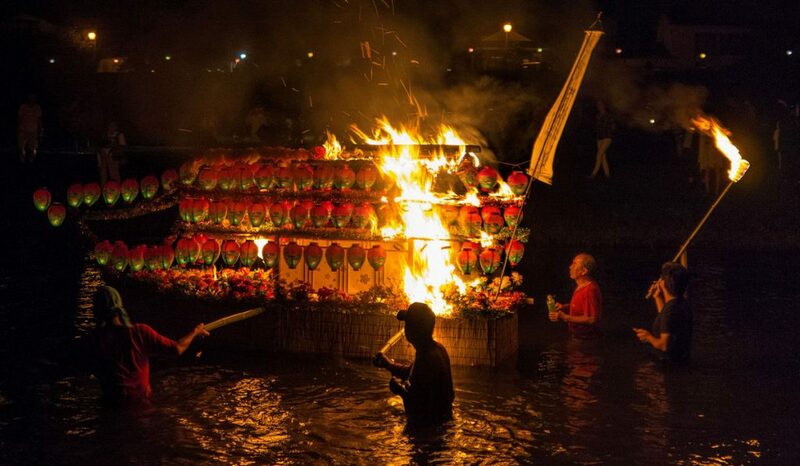 As part of the Obon festival, people float spirit boats called Shorobune carrying the spirits of the deceased down the river. 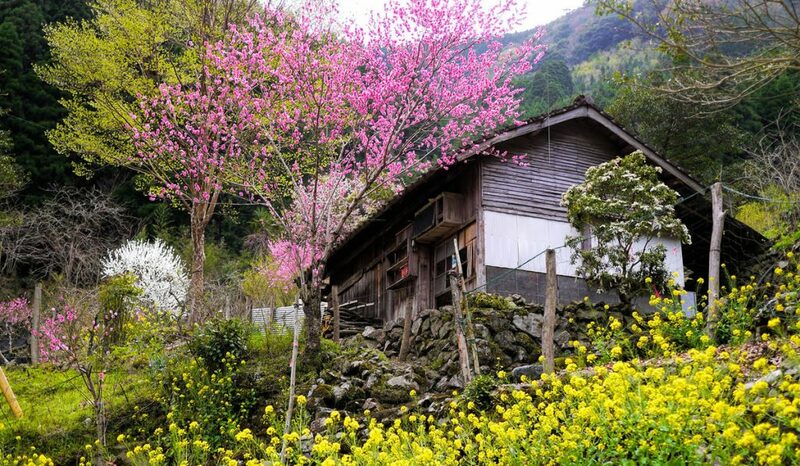 The small village of Toyo, famous for its ginger, looks wonderful in spring when colorful flowers bloom all around. 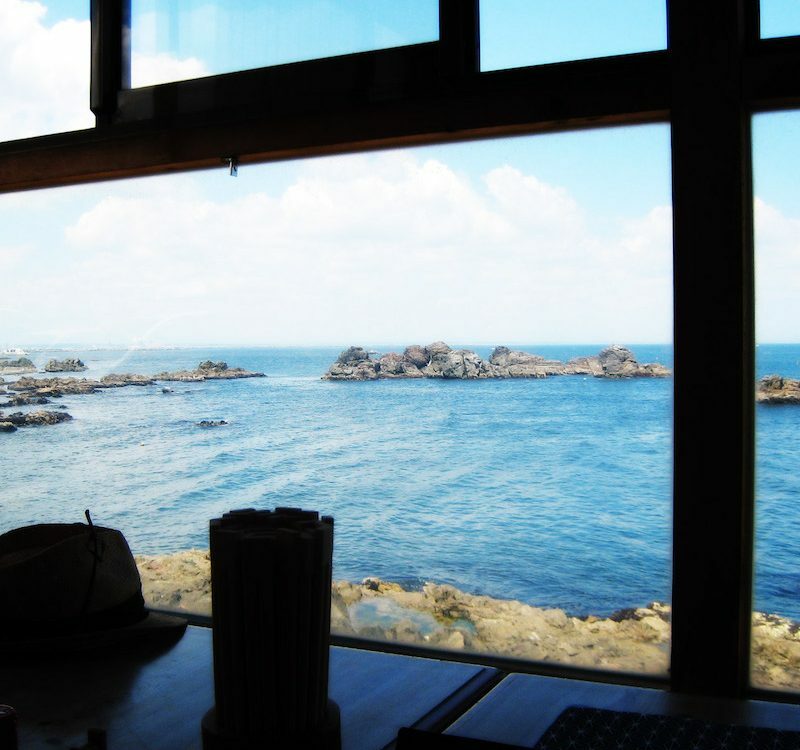 From the Cape Otachimisaki you’ll have a spendid view over the Yatsushiro Sea. 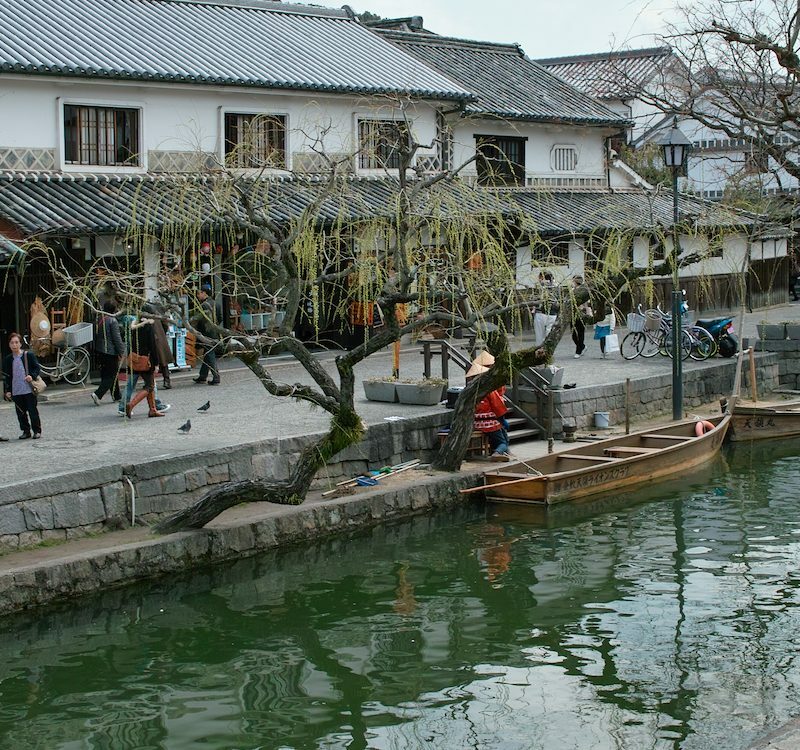 If you feel tired, enjoy a hot spring bath at the Otachimisaki Onsen Center. 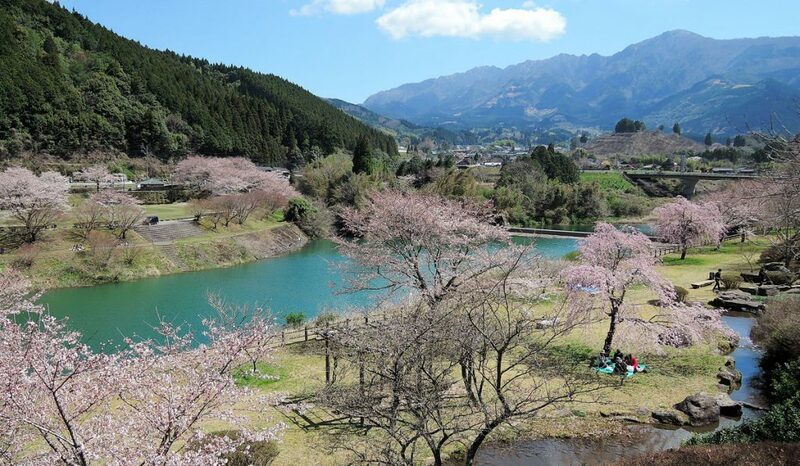 The Ichifusa Dam Lake turns into a wonderful spot for a leisurely stroll or a picnic, especially during spring when the many sakura trees start to bloom. 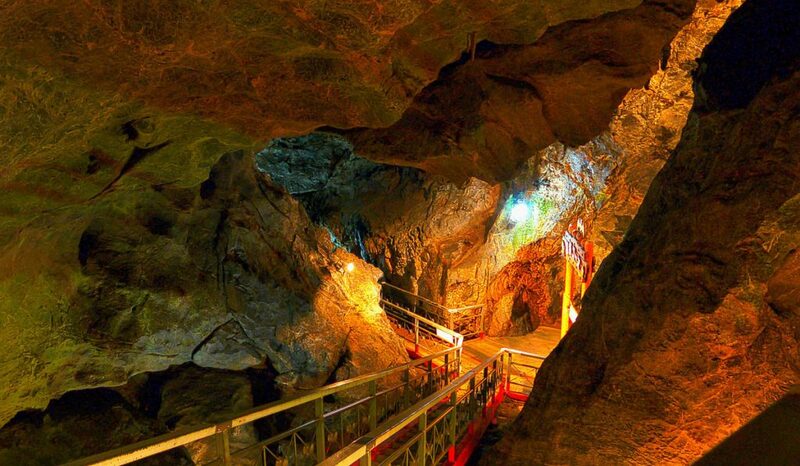 Visit the largest limestone cave system in Kyushu which was formed 300 million years ago. It is said that over 20,000 bats make this place their home. Also called Tenmon Bashi, the Amakusa Bridge no. 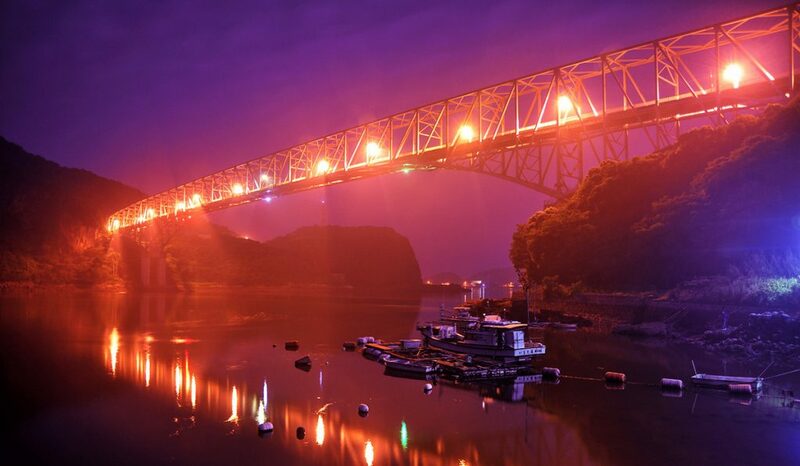 1 is one of 5 bridges linking the Amakusa Islands with Kyushu. 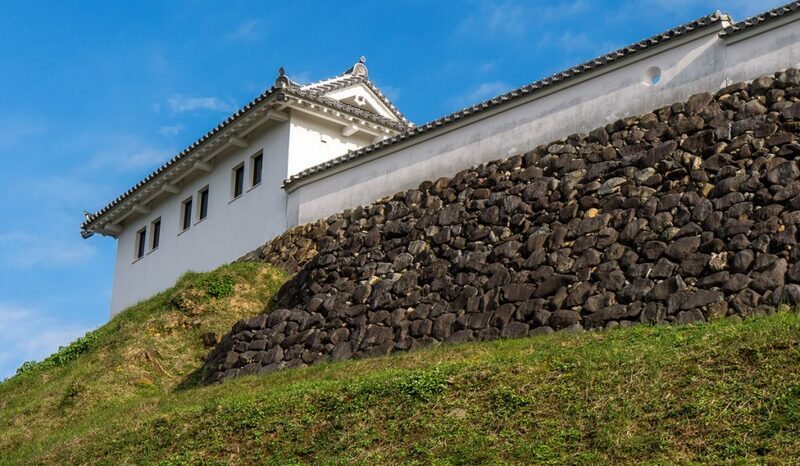 Built in 1602, Tomioka Castle, also named “Lying Dragon Castle”, looks over the Amakusa-nada Sea from a small hilly peninsula. 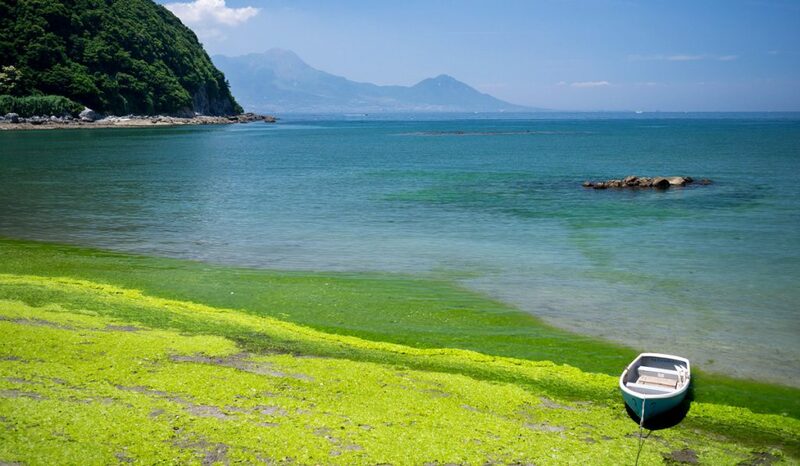 Algae bloom abundantly during the summer months turning the beaches a vivid green on Shirato Beach. 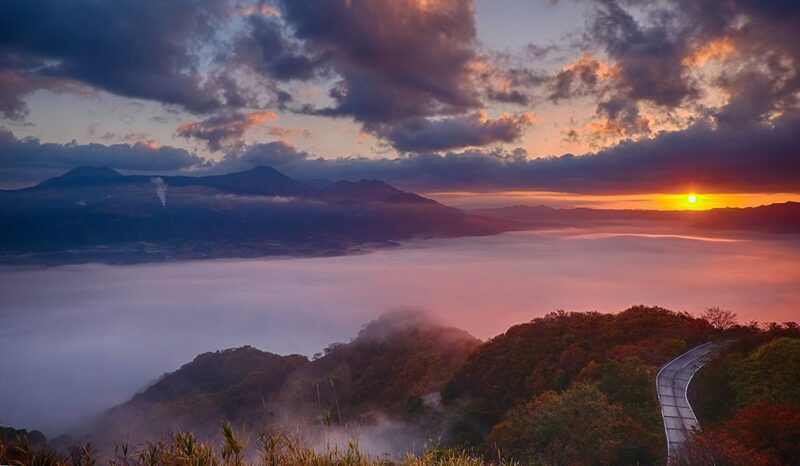 Kumamoto prefecture may be far away from busy Tokyo, but all who take the trip and visit this southern prefecture will be rewarded with bountiful nature, majestic mountains and a unique and rustic culture that you no doubt will fall in love with. 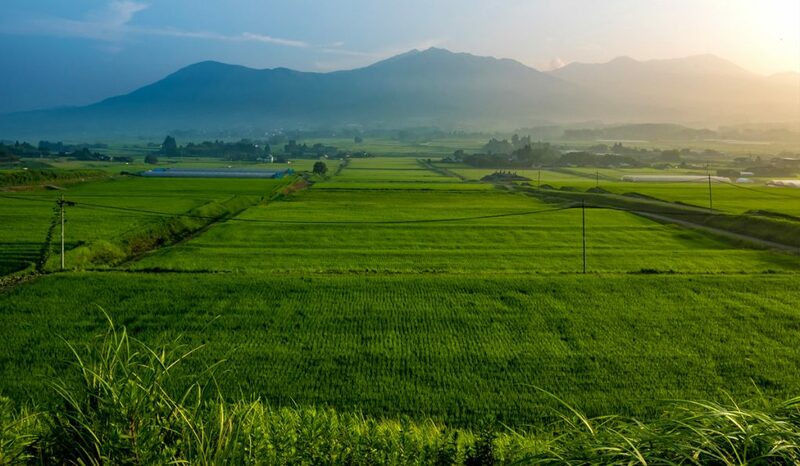 For more information about Kumamoto prefecture, visit the official Kumamoto website. All photo’s are credited to 浅川浩二. 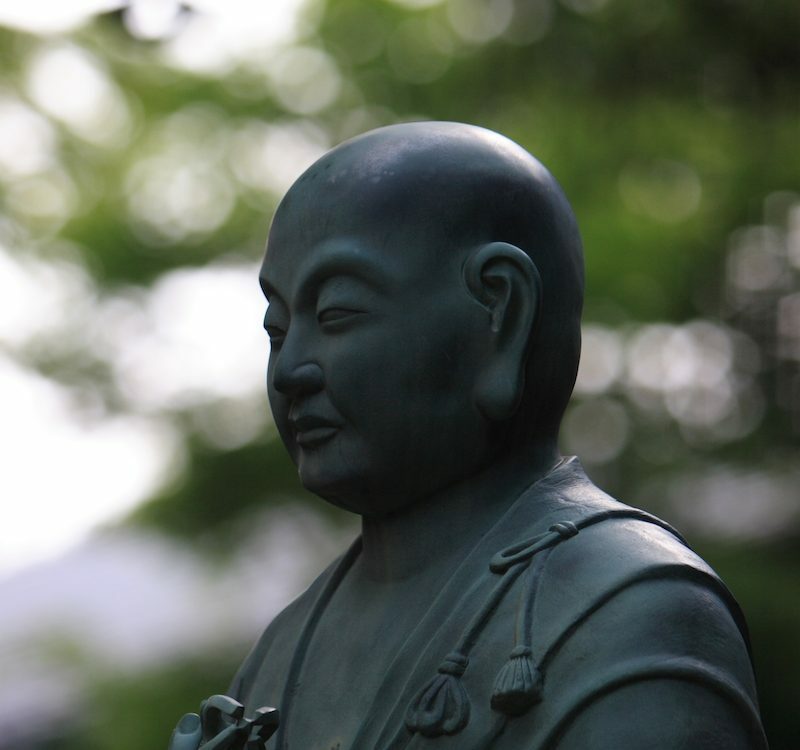 Have you fallen in love with Kumamoto prefecture? 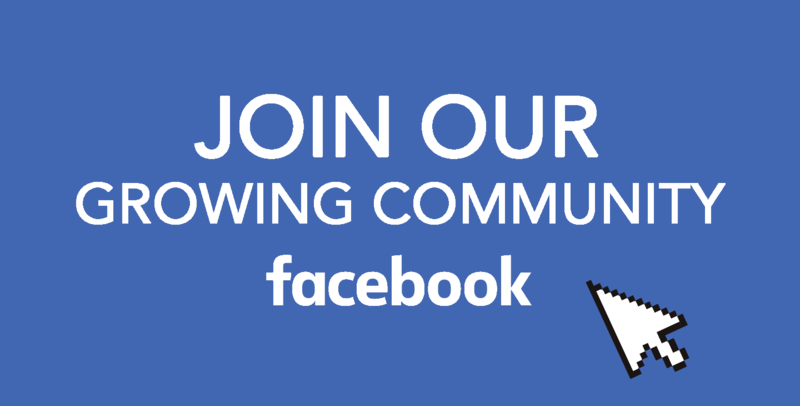 Share your thoughts on our Facebook group. 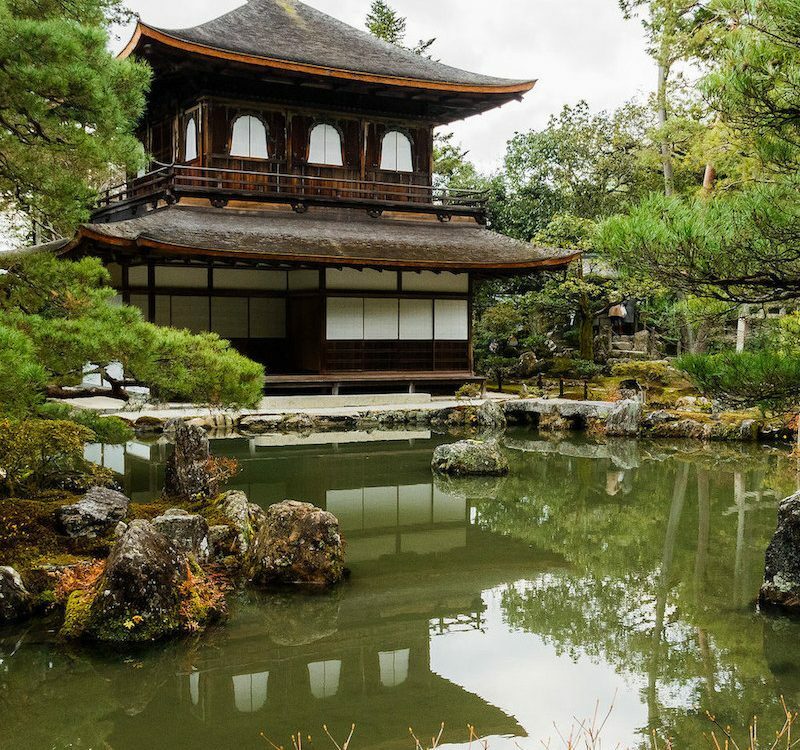 Be sure to subscribe to our Facebook, Instagram, Twitter, and Pinterest for more good stuff about Japan.